Comet P/2016 BA14 was originally reported as a minor planet when discovered by the 1.8-m Pan-STARRS1 telescope on 2016 January 22 but further images taken with the 4.3-m Discovery Channel Telescope on 2016 Feb. 10.2 and 13.2 UT showed a tail about 10" long in p.a. 65 degrees. It is very likely that P/2016 BA14 is a small fragment of comet 252P/LINEAR, both comets making close approaches to Earth during March 21-23 2016. 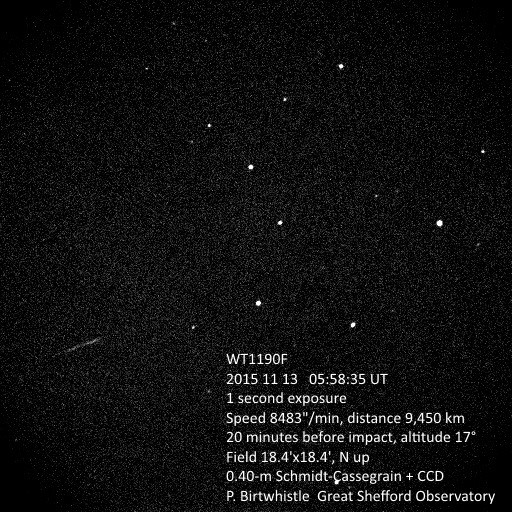 With the comet moving from far south declinations swiftly northward during mid to late March the night of the full moon, March 22 was the first opportunity to image this tiny comet from Great Shefford, coincidentally the date of closest approach to Earth, with the comet at slightly less than 10 times the distance of the moon. The images below were taken with P/2016 BA14 just 37 degrees from the full moon and some interference from passing high cloud too. Each frame is made from a stack of between 80 and 94 individual 6 second exposures and all stacked frames show weak cometary activity extending to the south east of the nucleus (to the lower left) between p.a. 120 - 170 degrees. The best stacks show indications of a tail at least 3.5 arcmin long in p.a. 147 degrees. The anti-solar direction is in p.a. 126 degrees. Comet P/2016 BA14 showing weak cometary activity on 2016 March 22. An object discovered by the Catalina Sky Survey and assigned the designation WT1190F initially looked very much like a near-earth asteroid when added to the NEO Confirmation Page (NEOCP) on 3rd October 2015 but it was removed by the Minor Planet Center two days later with the note "Was not a minor planet". The astrometry at that time showed it was orbiting Earth every 21 days in a very unusual and elongated orbit taking it to within one Earth radius of the surface of the Earth at perigee but 1.65 times further away than the Moon at apogee. The eccentricity (e) of the orbit was 0.96. Even while it was still on the NEOCP I had been in contact with Bill Gray, the author of Guide and also of FindOrb, because the orbit appeared similar to an unidentified object picked up in October 2009 (9U01FF6) and also to an object discovered in February 2013 (UDA34A3) that Bill had subsequently managed to link to another discovery in November later the same year (UW8551D). 9U01FF6 was in a ~25 day orbit with e=0.83 at discovery and had been followed for a couple of days by a number of observatories. I had then managed to follow it at a further five perigees up to May 2010 and had written about it in Oct, Nov and Dec 2009. UDA34A3 (= UW8551D) was in a 29 day orbit with e=0.86 in February 2013. Bill's linkage between the two 2013 objects was remarkable, as UDA34A3 was only observed for 5 hours in February and UW8551D for less than 2 hours in November! Bill pointed out on 5th Oct. 2015 that calculating the orbit of WT1190F forwards showed that it would impact the Earth on 13th November 2015! Subsequent astrometry confirmed this, impact occurring less than 10 miles south of Sri Lanka at 06:19 UT on 13 Nov. 2015, in daylight, around noon local time. Bill eventually managed to show that WT1190F was the same object as UDA34A3 = UW8551D from 2013, though he faced considerable difficulties due to the effects that solar wind has on this apparently very low mass object, together with close approaches to the Moon. Bill then requested if both the Catalina and PanSTARRS surveys could search their archives using the new linkage to see if they could find any further images of WT1190F going back that might link up with 9U01FF6 from 2009. PanSTARRS managed to locate and measure images going back to December 2012 but even with these, attempts to link the 2012-2015 apparitions back to the 2009/10 observations of 9U01FF6 proved impossible. However, Bill then figured that maybe the prediction from the 6 months of observations of 9U01FF6 from 2009 might be good enough for the surveys to locate images extending the arc forwards from 2009 to try and join the two arcs up that way and indeed both Catalina and PanSTARRS managed to find it in their archives from January and April 2011. The April positions were crucial as a lunar flyby in February 2011 had made the orbital elements very uncertain after that date. With the new positions Bill was able to calculate 9U01FF6 forwards to another lunar flyby on 24 May 2012 and similarly calculate WT1190F back to the same flyby and prove they were indeed the same object. Have a look at the very comprehensive FAQ provided by Bill Gray here. WT1190F is thought likely to have been part of an old lunar mission and from the way it was easily blown around by the solar wind it is probably hollow and 1-2 meters in size, possibly something like the Lunar Prospector TLI stage from 1998. A team from ESA observing from an aircraft over the Indian Ocean witnessed it burn up in the atmosphere exactly as predicted, this image and more details can be found at their page here. The Juno spacecraft made a very close approach to Earth on 9th October 2013 at 19:21 UT, passing just 560 km above the sea near South Africa, before swinging around and heading out for Jupiter. The images here were captured between 20:23:33 UT and 20:24:47 UT with Juno at an altitude of just 14 degrees, soon after it rose above the horizon, just over an hour after the close approach. Exposures were limited to 1 second to freeze the motion and allow positions to be measured. Juno spacecraft 1 hour after close approach, moving at 800"/minute and at a distance of 42,500km from the observatory. 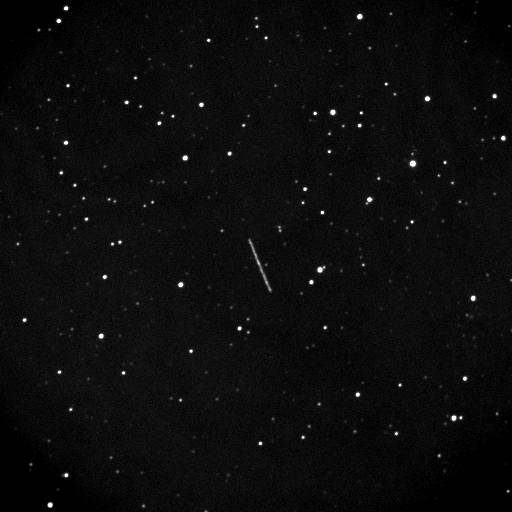 Here a 20 second exposure shows Juno streaking in front of the distant stars, already much slower moving and more distant than the image above. On the night after closest approach, when the apparent motion had slowed down to around 15"/min and magnitude faded to about +15, three hours of photometric observations were obtained, the diagram below indicating that just a part of the overall rotational lightcurve had been captured, showing a rise to magnitude +14.3R, followed by a fall to +15.9R. Radar results for 2012 DA14 obtained from NASA's Goldstone facility and qualified by Dr. Lance Benner on MPML indicate a rotation period of "probably somewhat longer than 8 hours". Update 20/2/2013 20:35UT: A much more complete lightcurve by Bruce Gary from Hereford Arizona Observatory (G95) can be seen here, covering about 10 hours of observing, yielding a rotation period of just over 9 hours. 2012 DA14 captured on its way out from its very close encounter with Earth. The NEO was 8th magnitude and moving at 1,645"/minute when these images were obtained and was nine times closer than the Moon. At its closest at 19:24 UT on 15th Feb. 2013 it had come inside the geostationary satellite ring but by the time these images were taken 80 minutes later it had already passed back outside. Exposures were limited to 0.2 seconds to stop the asteroid from trailing so the images could be used to measure the object's position. A few gaps in thickening clouds only allowed a short run of images to be captured between 20:43 - 21:00 UT, before the sky completely clouded over. 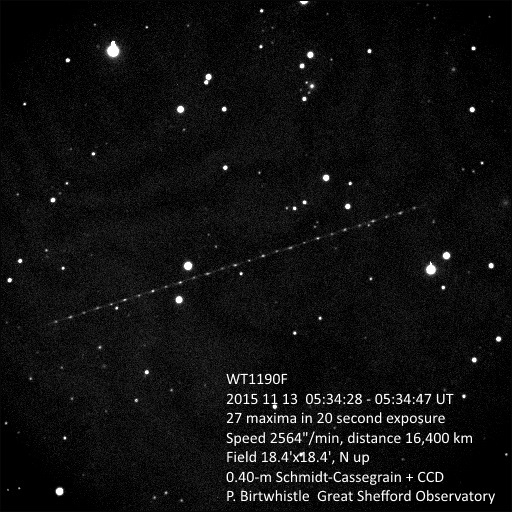 Welcome to the Great Shefford Observatory blog, highlighting recent work done, generally on Near-Earth Asteroids.